Note from the label : "we pressed a strictly limited edition with the original 'Amark' label artwork, it even contains the original b-side, a blues track titled "no good woman". limited to 200 copies, 9 euro. The regular 'Tramp' release which is identical to the Amark version (it just says 'tramp' instead of 'amark' and has the disco version of you aint my brother on the flip) is 6 euro. Milt Larkin led one of the greatest of all territory bands but tragically it never recorded and today can only be thought of as legendary. He was self-taught as a trumpeter, inspired to play after hearing Bunk Johnson. Larkin freelanced throughout Texas including with Chester Boone and Giles Mitchell's Birmingham Blue Blowers. During 1936-42 he led his famous band which toured in the Southwest and played briefly in Kansas City, Chicago and at New York's Apollo Theatre. Among his sidemen were Illinois Jacquet, Arnett Cobb, Eddie "Cleanhead" Vinson and Wild Bill Davis, all of whom were unknown at the time. The orchestra broke up when he went into the military. Larkin played in an Army band (1943-46) that was led by Sy Oliver and began doubling on valve trombone. In 1946 after his discharge he had his first opportunity to record, but by then his moment had passed. Larkin continued leading bands throughout much of his career, settling in New York in 1956 where he often headed a septet at the Celebrity Club. He retired to Houston in the mid-1970's and one can only speculate today how great his original territory band must have been. Milt Larkin's only dates as a leader included a total of 11 selections (mostly as a vocalist) for six different labels during 1946-54. 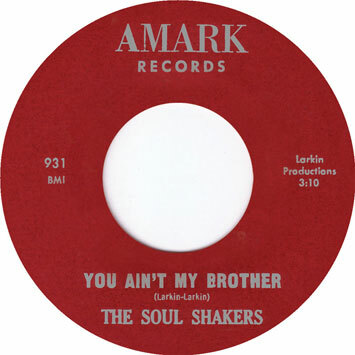 In the late 60s he recorded the now sought after 45 rpm single for the 'Amark' label (Amark 930/1 "You Ain't My Brother" b/w "No Good Woman") under the name 'The Soul Shakers'. In 1976 he released his final longplayer on 'Copasetic' Records out of New York which includes an updated instrumental version of "Ain't My Brother". This time he called himself Milt Larkin & His All-Stars. As a special gift for all collectors out there we pressed again two different issues. The 'Tramp' issue contains both versions of "You Ain't My Brother" while the limited 'Amark' issue is limited to 250 copies. Beside that the 'amark' issue comes with the original b-side, a blues track titled "No Good Woman".